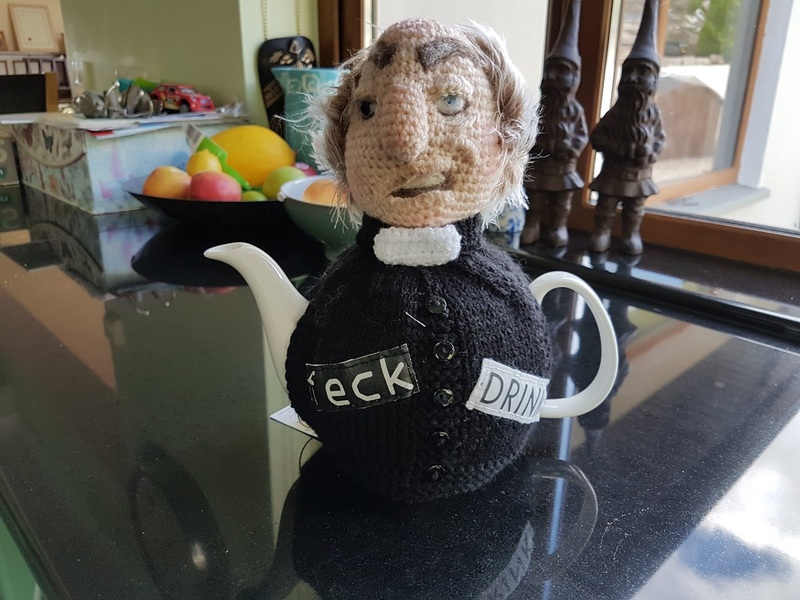 My son phoned earlier this week in a panic informing me that his significant other had bought them tickets to go to a comedy night in Cork tomorrow night! Arrgghhhhhhhh!!! He was desperately seeking advice as to how best to tell her that he couldn't commit to such hilarity as Saturday 29th September would be spent on a Ryanair flight back to Shannon 'considering' the events of earlier that day in the London stadium! Ahem! I pondered for a moment before suggesting he should lean on a bit of prison slang to emphasise the importance of events in London and his need to be present. This one is the Barry McGuigan son, I advised. This is the principal reason that we have season tickets for the London Stadium. This is the big un! Thankfully, she got it. 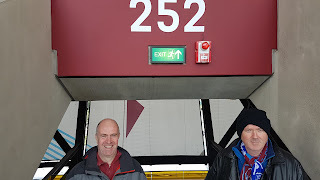 And now we are on our way to observe the game that Hammers fans enjoy the most - forget Spurs et al, the visit of the Red Devils is the game we want to win most of all! 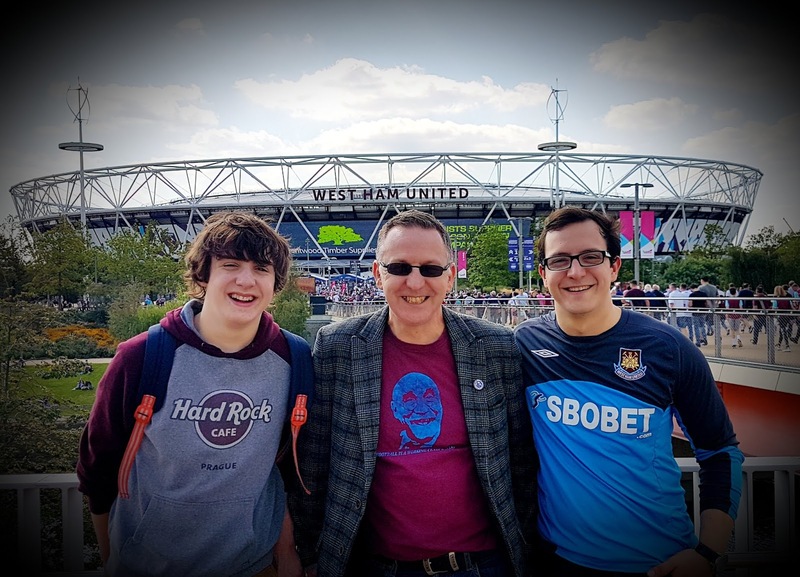 With a queue as long as your arm of potential replacements, he was given the permit to abandon his bofriend duties and give it socks in support of the Hammers. Let's hope he has a tale of endeavour and heroism to recount, and after a string of performances that suggest that we have finally absorbed the essence of the Pellegrini method, it's looking pretty hopeful. Arnie is scheduled to return, our defence looks to be on a good wavelength and Anderson and Yarmolenko look like they are enjoying their game - even better, as the Special One and Pogba pretend to be friends, the Mancs look vulnerable for an East End drubbing! Against Chelski we conceded the bulk of possession, but today Pellegrini will be looking to dominate as much as possible and prevent a fractured Man Utd from getting any rhythm. Rice against Pogba will be fascinating as our wonderkid gets to go toe to toe with the World Cup winning midfielder. Predicted starting XI: Fabianski, Zabaleta, Masuaku, Diop, Balbuena, Noble, Obiang, Rice, Anderson, Yarmalenko, Arnautovic. Everybody knows the Count's favourite number! The Cup can bring all sorts of extravagant fare - giant killings (yes, we know! ), joy and tragedy (F*** off Stevie G! ), and hopeless mismatches. Wednesday night saw the ruthless side of Pellegrini - something we Hammers can remember from a recent cup mauling by Man City, as a dominant Hammers side simply didn't know when to stop. All over the world, various protection activists abandoned their posts to express outrage at the whipping dished out by a second line Hammers side to poor League 2 Macclesfield. Hammers fans were left with a terrible sense of self loathing as we murmured 'enough is enough now lads' while secretly wishing for more. Disgraceful, unwarranted but simply delicious! It had been 35 years since the 10-0 mauling of Bury but in the modern era such huge goal spreads are much less common, making this possibly our greatest ever dismantling job! Speaking after the game, Rory Nostradamus revealed "eight was probably a bit harsh on the Macc Lads, I'd settle for 4 or 5 against Man U on Saturday!". Confidence is high right now and maybe after all the disappointment of the first four games we have earned the right to savour a bit of success! Back on track after last week's impressive display at Everton, Manuel Pellegrini's troops will be relishing the chance to show what they can do against Premiership high flyers Chelsea. 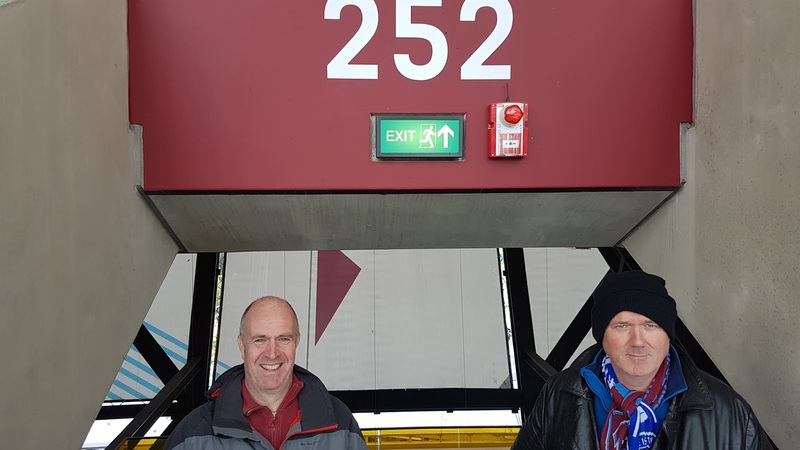 VERYWESTHAM will be attending in the company of some Chelsea supporting 'friends' and the pre match banter has identified three major talking points that will be central to the outcome. 1. Can the Hammers deal with Eden Hazard? Well rested after missing Thursday's Europa League trip to Greece, Mr Hazard has been on fire this season in a more central roving role. Pellegrini likes to focus primarily on his own team rather than base his tactics on the opposition's strengths, but Hazard poses an exceptional threat that makes you feel that West ham need the pacier Ryan Fredericks instead of Zabaleta, and Aaron Cresswell's better defensive abilities might give him the edge over Arthur Masuaku. Thankfully Diop and Balbuena are starting to develop a decent understanding and will need that today. The Noble/Obiang/Rice triad can provide better cover in front of the defence but need to be careful with Alonso's free kick ability. 2. Will Arnie be leading the line? The rumour mill suggests that Arnautovic is likely to start today. He thrives on big games and let's hope the growing relationship with Felipe Anderson and Andriy Yarmolenko can be a factor today. Chelsea are least impressive at the back with Rudiger and Luiz like a high line and Pelle will be hoping that Arnie and company undermine this from the start. 3. Can the Hammers fans get a good atmosphere going. Against Wolves the London Stadium lacked passion and was not helped by the limp on-field performance. We really need to get a vibe going today - an early goal would certainly help! Kick off is at 1.30. Sunday's victory at Everton is likely to go down as a major landmark in the Pellegrini era, marking the end of a troubling start to his leadership and the beginning of what should be a push up the Premiership rankings. Having only beaten Everton twice in our previous 22 attempts at Goodison, it was especially pleasing to get the better of our bogey team. The significance of the result was further emphasised by the fact that in their Premiership history Everton have scored more goals against West Ham than any other team! That said, the manner of the win was a major talking point as Pellegrini's team demonstrated pace, mobility and precise passing that simply left Everton chasing shadows for long periods. Despite a four game losing streak, his calm assuredness was demonstrated by a team that looked confident and determined. 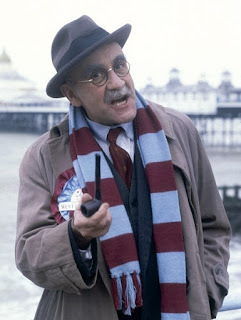 There was a sense right from the beginning that this was West Ham's day! Add to that the presence of Theo Walcott on the Everton team (have we ever beaten a team he was playing for before?) and with our least popular referee, Martin Atkinson, officiating, this was a day when we picked a few bogeys! The one uncertainty from the game was who should get Hammers MOTM? Declan Rice was superb and seemed to be everywhere, Felipe Anderson was a constant thorn in Everton's side - both in attack and defence where he provided tremendous support for Arthur Masuaku in keeping Walcott quiet, Diop followed up his MOTM performance against Wolves with a similarly assured display at the heart of our defence, while Arnie created one and scored another - all the while urging his teammates on to keep the pressure on the tired looking Toffees, but with two goals in his first starting competitive game, Andriy Yarmolenko surely gets the MOTM award? You'd imagine that it's a pretty happy training ground this week out in Romford! Let's hope we can be as fluid against an impressive Chelsea side who come visiting next Sunday! The team sheets are in and Manuel Pellegrini has opted to change things once again as Andriy Yarmolenko gets a big chance to impress with a starting spot with Rice, Obiang and Noble in the centre. Arthur Masuaku is fit, while Pelle is keeping it tight at right back with Zabaleta starting. Diop and Balbuena will be hoping to build upon the Wolves showing where Diop was excellent. Anderson and Arnie are up front as Snoddy starts on the bench. West Ham: Fabianski, Zabaleta, Balbuena, Diop, Masuaku, Obiang, Noble, Rice, Yarmolenko, Arnautovic, Anderson. As If Things Aren't Bad Enough.......And Now This! It's been a trying start to the Pellegrini era to say the least. After a £100M investment and a decent preseason campaign, West Ham have lost all four Premiership games and look set to break our own embarrassing record of consecutive defeats at the start of a season with a tough trip to our bogey team in Everton! When you are down on your fortune there is no shortage of fools to offer 'friendly' advice as to how to improve your lot and luckily for Pellegrini Stan CollyWobbles, football Yoda, has stepped up with some to quality advice - to sell Marko Arnautovic!!! Arnatovic was our player of the season last year and has offered the few moments of respite so far this season with his two goals. He has run and run despite playing in an underperforming side and has set an example with his work rate and commitment that is surely the basis of West Ham's desired recovery? Many fans would agree with the sentiment that 'if only we had eleven players like Marko'! But the world of football punditry is no stranger to gratuitous controversy which seems the best explanation for Collywobbles unprovoked attack upon the Hammers star. Referring to Marko as a fancy Dan, he has suggested that "he (Pellegrini) needs to get rid of players like Arnautovic and build a proper spine ­before adding the players around the periphery". Perhaps Stan should stick to his other hobbies and leave Pellegrini and his 35 years of managerial success to work out what to do next? Let's hope that we can get a result today - if only to get away from this type of speculative nonsense! 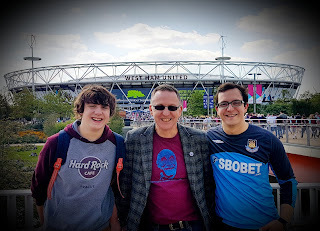 It all started so well for the VERYWESTHAM crew, catching the 7am flight from Shannon to Stansted and then off to a family event in East Ham before making the walk to the London Stadium. The atmosphere was a tad restrained, but understandably so given our three opening defeats. Still , Arnie was fit and we were at home, right? Wrong! After 15 minutes I wondered if the lads had been segregated in training as we were struggling to complete simple passes while Wolves looked sleek. After half an hour it was obvious that we lacked leadership and, for all his lack of pace and vulnerability beside Wilshere, we were missing Mark Noble. At half time I wondered how many Pellegrini would substitute at the break. Fab, Arnie and Diop aside, we looked lacklustre. No changes at half time but we had a decent first 20 minutes in the second half before we slackened off and Wolves took over again, creating three really decent chances before Arnie almost stole a winner with a break against the run of play. Wolves were saved by their goalkeepers's face and thereafter we looked to have settled for a draw. Until Wolves scored in injury time. In all honesty, it made for a fair result. We look lost, almost Abram Grant level of bewildered. Hmmm. It's early days but with a series of tough games ahead you'd have to wonder where any points might be coming from. My sense is that the noard will stay calm for a dozen games. Hopefully we will do a typical Hammers and beat a few big boys to kick start things. Failing that, the Claret n Blue cup against Burnley is looking like a big big game for Pellegrini! Ratings of starting XI: Fabianski 7, Diop 8, Balbuena 6, Cresswell 5, Fredericks 5, Wilshere 5, Sanchez 6, Antonio 5, Anderson 4, Snodgrass 5, Arnautovic 7. Crowd Rating 4/10. In fairness, we had very little to get energised by in this drab performance. It was all too easy for Wolves.